There are some great restaurants in Bangalore and some brilliant food experiences to be had. But there are times when I would rather swap my high heels for my walking shoes and hit the streets of Bangalore in search of something good to put in my tummy. 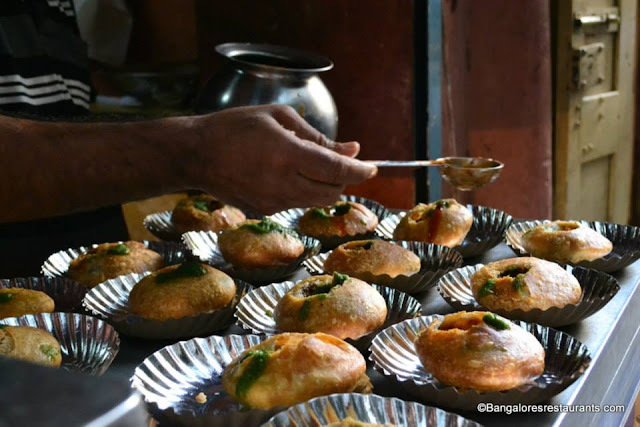 The street food of Bangalore does not have too long a history like some of the places you may find in Delhi and Mumbai, but it definitely has fed a generation or two by now and has its share of loyalists. Most street food places tend to open up in the evenings - post a hard day's work. Hordes are seen thronging these places. After all, if you are familiar with Bangalore's traffic, you would rather stand in a place and eat, than be sucked into a serpentine traffic jam. But don't fret if you have your agendas set for the evenings. There is a way you can start your day with something interesting, if eating on the streets before heading to work is your kind of thing. Wander around the Pettah (Avenue Road / Nagarathpet) area of Bangalore, the original commercial hub of the city; one with immense history and one which, quite literally gave birth to the story of Bangalore's growth. You will find what is perhaps the first food (more like coffee) truck in the city. Though it does not serve any food, the VRWS Coffee Board Truck hands out some great coffee. Do make sure you are there before 10AM, when the truck disappears - in complete Dr. Who style. 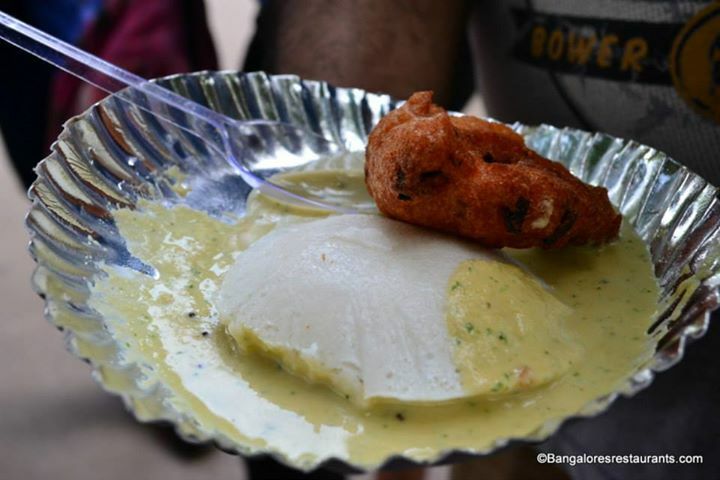 Follow the coffee up with some great Idlis and Vadas at one of the many carts that line the street. If you can spot Kasturi and her husband with their signature sweaters and mufflers, you will get an authentic Tamil Nadu touch to your breakfast with tiny bits of onion being loaded into the vada. Everything is off the fire and into your little paper plate. Eat with your elbows sticking out to ward away the hordes leaning over you for their share. With the idlis done, maybe some great kachoris from Madanji will seal the deal for you. Squeezed in between a few very narrow roads, somewhere in the Pettah area, with just enough space for two bikes to pass through together is a small door (yes, door!) in the wall. This opens up around 7.30AM, or perhaps a little earlier and dishes out some great kachori, jalebis and really interesting stuff. Again, getting here early is the key because Madanji tends to run out of goodies soon, savoury green and tangy tamarind chutneys and all. If you find yourself in the Johnson Market area, during your lunch break or even post work, wind your way to Makkah Cafe - which literally is a hole in the wall, seating maybe 6 at a time. Most of the crowd however makes the pavement their cozy spot. Pick from the Khova or Kheema naans you see there. Or just wait a while till you see a battered scooter bring in the fresh batch of kheema samosas. Pounce as soon as you can. And do make sure to stroll along to the next pillar where you will see a cauldron of sorts with a constantly bubbling harira - a glass of this or a half glass chai and a samosa and you are sorted... till of course you walk into Johnson Market and your senses are assaulted by all the goodness you smell around you. Stroll over to Siddique's and you will of all the popular offerings to choose from. My favourite has always been the Bombay Beef Roll - this is rolled and kept ready to go. The second your order comes in, the roll flies onto a sizzling tava, its wrap seared to a crisp and transferred to a paper plate. Be sure to place a nice thick handkerchief on your hands before accepting the plate - else, the intense heat will have you involuntarily feeding the street dogs hovering around. Those guys have a way of picking the person most likely to do this! There is a lot more Johnson Market offers, especially the beef biryani and veal kebabs over at Khazana. Once you are done, be sure to head back to Makkah Cafe for their Suleimani chai. Go home and sleep the sleep of a satiated puppy. On any other day of the week, choose to go to the place that is most revered in Bangalore for its street food - VV Puram aka Food Street aka Thindi Beedi. It is a road, dedicated to every permutation and combination of dosas, paniyarams, chaats, rolls and more. We have scoured the street in search of some gems and there are plenty to be had. An interesting discovery was the Rasgulla Chaat - your regular rasgulla, meets its partner in savoury yogurt base rather than a sweet chasni one. Lavished with all the trappings of a chaat, it packs quite a punch, visually and on the palate. Another interesting discovery was the Floating Paani Puri at Ganesh Chaats. No need to stand around the paani puri wallah waiting for him to drop the next puri into your katori. The puris are filled, placed in a plate and drowned in tangy paani. Finish this dish up with a cold jeera drink that is also popular here. And of course the corner stall on the road that sells Gulkhand with fruits and ice cream. Almost every sojourn to Food Street ends here - No shying on the quantity of fruits or the variety. Everything in season finds its way to your bowl. The ice cream and gulkhand make it an irresistibly delicious dessert. If you are strolling home after all the indulgence you may also want to take a charcoal roasted bhutta for the road. Smeared liberally with spices and condiments from the makeshift spice bottles you see below, the bhutta here tastes amazingly different from all those you may have had around the city. VV Puram is also the host street for the annual Avarekai Mela or the flat beans mela. Scores of stalls sprout up at this time in the area servings hundreds of sweet and savoury variations of the beans. For the meat loving street food enthusiast, perhaps the greatest place to find peace is at Shivajinagar. Walk down from the bus stand and it is your nose that will help you find the beginning of the road to your tummy's salvation - from the scores of handis with samosas roiling in the them to platters of kebabs and cutlets, the place is a delicious assault on all your senses. Chicken and mutton rolls, kebabs, tikkas and filled naans - all vying for your attention on a display tava. Point out to what you want - watch it be finished to perfection and cuddle up with it at the nearest corner you find and dig deep. Let your eyes travel a bit and you will spot a street that is lit up entirely by gas lanterns placed high over carts. Each of these have a few benches to squeeze in some people, and a lot of standing space, which does not ensure you any personal boundaries. Skewered meats are on display - from chicken and mutton to an array of teetar or quails - all waiting for you to select from. The teetar is what we usually go for - don't go by the redness of the meat - the spice levels are great and do ask them not drench the bird in chaat masala. And can we skip the idiappam or string hoppers with steaming hot veal kebabs. Such is the succulence of the meat that you will not want a gravy to dip your string-hoppers in. The crunch of the onions, the juicy moistness of the meat do a fantastic job of rounding off your meal. The food in Shivajinagar tends to be on the spicy side, so do stop by at one of the many stalls serving up ice cold falooda milks. And if you still have it in you by the end of it all, do stop by at Savera for a glass or two of their Suleimani chai. There is so much to the street food in Bangalore, that I often wonder on how far technology has come as far as tummies for hire goes. Till then, weekly sojourns will have me discovering more. In most places, a complete gluttonous indulgence will not see you spending more that Rs 400 tops.